Many people are interested in kimono but feel they are too expensive and difficult to take care of. This may be a solution to the problem. Kimono style dresses with a variety of colors and patterns. 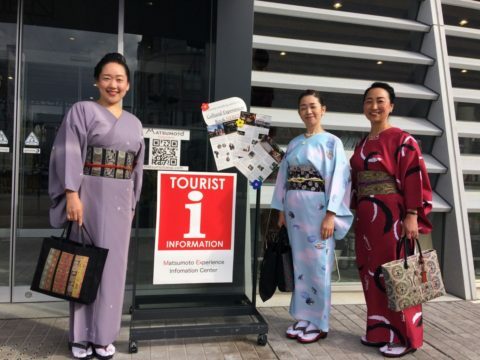 Three women from Iida city, the southern part of Nagano Prefecture, visited our information center today. The outfits they have on are kimono-style dresses with no neckbands. Their dresses are made of polyester, so they are inexpensive and easy to wash at home. Surprisingly, you need only 29 seconds (!!) to finish dressing, according to the ladies. Even though they are not "proper" kimono, they are great as casual clothing, aren't they?